Representative from Franklin county, was born February 11, 1857. His parents were originally from the north of Ireland, coming to Ohio at an early age. They moved from Ohio to Franklin county, Iowa, in 1856, and have lived there ever since. Was raised on a farm and farming has been his occupation until the present time. Was married October 9, 1881, to Miss Kate Eliott and to them were born six children. 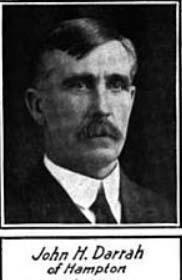 Elected representative in 1914. A republican in politics.